This is my grandfather William Henry Crumplin, he was a First World War Veteran who was awarded medals for bravery, but apparently he never like to talk about it……So it’s left to me to do so! Gilly Roots’ roots on my mother’s side are firmly planted on the Surrey/Hampshire border around Guildford, where most of them still live today……But a few have flown the coup as far as Australia! This section is dedicated to my Auntie Lil, at 86 she is as bright as a button and without her help l would be struggling, God bless Auntie Lil (my mother’s sister). Below is my granddad Bill with his mother, my great-grandma Annie. ‘1685 Cpl. W. Crumplin, 7th Bn., E.W. Surr. Egt. (Farnham). And also two Military Medals (MM) this was a military decoration awarded to personnel of the British Army and other services, and formerly also to personnel of other Commonwealth countries, below commissioned rank, for bravery in battle on land. The medal was established on 25 March 1916. It was the other ranks’ equivalent to the Military Cross (MC). For his bravery in the field he was appointed the King’s Sergeant, he was a very special, brave man and to be a King’s Sergeant is very rare, it has pretty much mythical standing in the army and it means that whatever happens only the King himself (well Queen now) can strip him of his appointment…..l am astonished and very proud to be a descendant of such a great man. It is so gratifying that l have been given these photographs of my granddad Bill, it gives me a picture of some parts of his life that l would not have known……Thank you so much my new-found cousins. 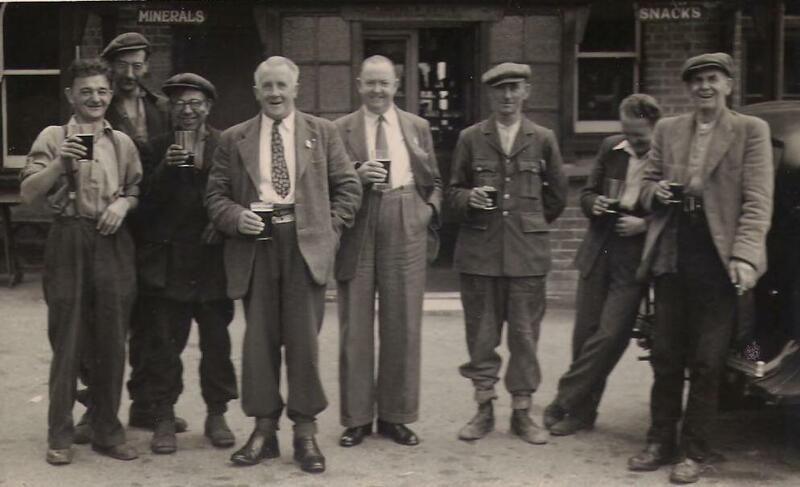 This is granddad Bill having a pint with his mates, he is the man in the army uniform. Ah love him! He’s the one l got the ears from….Sorry that l passed them on Honor Scarlett!! 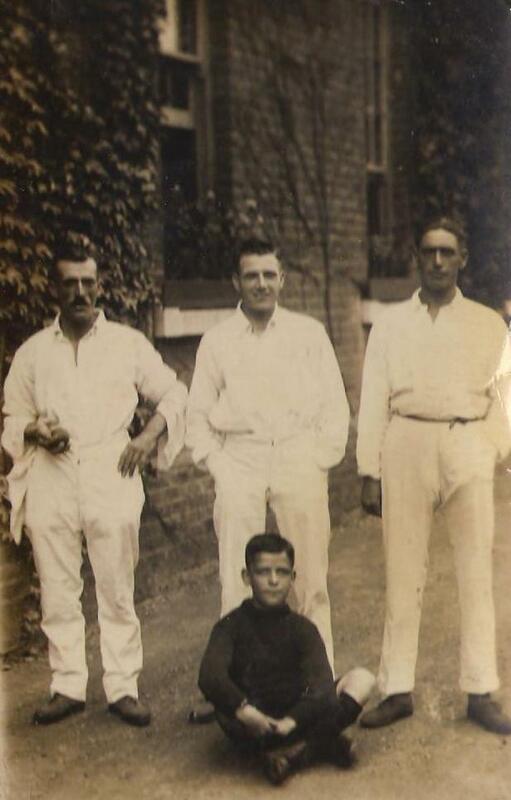 Granddad Bill is on the right, he must’ve played cricket as this photograph is testimony to that, as he and company are all in whites……l will investigate this further?…. 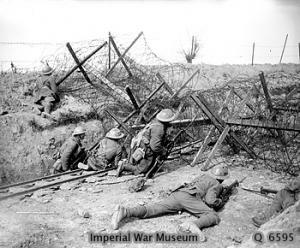 A picquet of the 10th Battalion, Queen’s (Royal West Surrey Regiment) lie behind a wire ‘block’ on a road at St Jean during the Battle of the Lys, 29 April 1918. From the Imperial War Museum collection, with my thanks. Jan 1919 DCM for conspicuous gallantry at Tara Hill 23 August 1918. Jun 1919 MM for bravery in the field. The Queen’s was sometimes known as the Mutton Lancers, after their “Lamb and Flag” cap badge. Formed at Guildford in September 1914 as part of K2. September 1914 : attached to 55th Brigade, 18th (Eastern) Division. 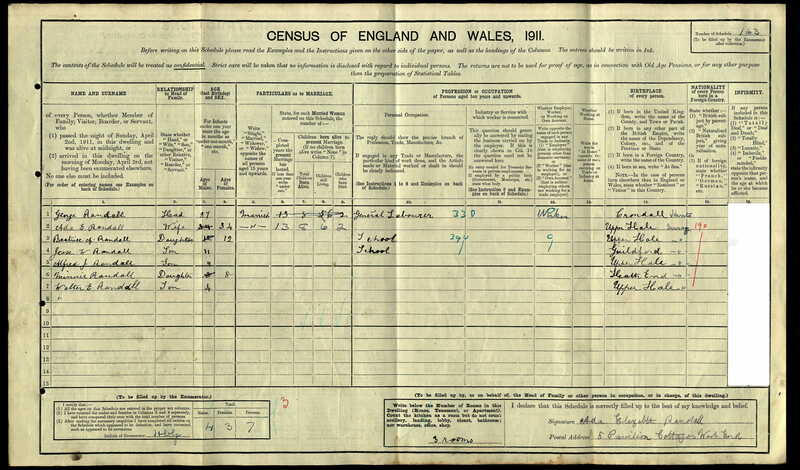 My Granddad – Sjt W Crumplin DCM MM…………. 1685 &jt: ‘Crumplin, W.,- D.CM., 7th Bn. Bn., R.W. Surr. R. (Farnham). 1685 Cpl. 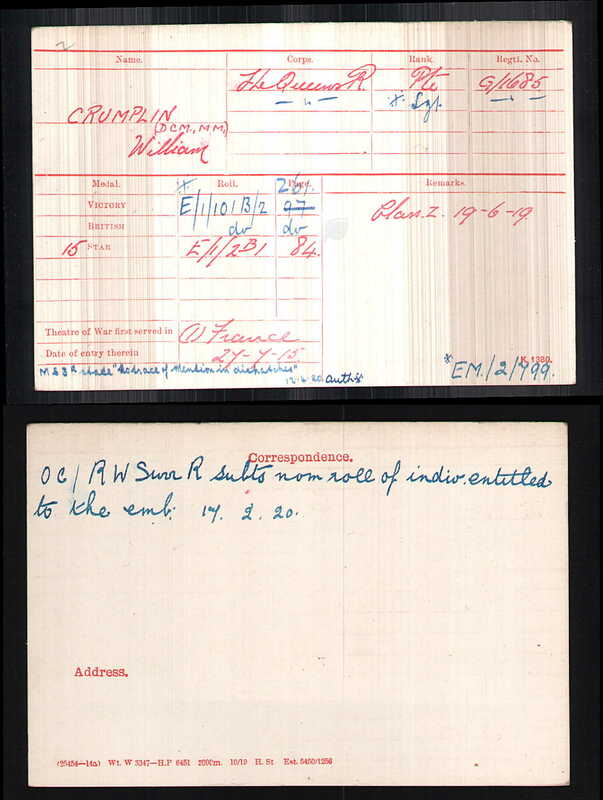 W. Crumplin, 7th Bn., E.W. Surr. Egt. (Farnham). EXCITING NEW INFORMATION……….THANK YOU SO MUCH TONY, TONY & I SHARE THE SAME GREAT X 4 TIMES GRANDFATHER WILLIAM CRUMPLIN !!! Tony says “Our common ancestor is William CRUMPLIN (1753-1838). He is George’s grandfather. He is your great x 4 grandfather and is also my great x 4 grandfather”. TONY(Marchant)…….“I found William Henry’s war medal card” ……. “The Medal card shows that he was Private (later Sergeant) G1685 in the Queens Regiment ( West Surrey regiment). He was awarded the Distinguished Conduct Medal and Military Medal (as illustrated above) and also the Victory Medal, British Medal and Star Medal. He first served in France”………My gratitude goes out to Tony Marchant for all this information. I remember my grandmother Minnie May as an ideal. I have this picture of her in my mind, she had a special presence and a smell that I can still bring to mind, warm pressed clean sheets, yes, that’s it! Of her allowing me to roll out the suet pastry for a syrup roly poly pudding, which was my favourite, she used to boil it wrapped in cloth…..It was the best ever! Speaking to my long lost family I recalled the pets and remembered that my Nan Minnie May had a cat, a ginger tom called Sandy and l dressed this cat up in little clothes, maybe baby or dollies clothes, l loved it, although if l did this today l would probably be arrested by the animal police! l think l was thoroughly spoilt ha ha. l remember being happy, also there was some kind of fir or pine trees near to Nan’s and l have always really loved that smell too….It was because of happy memories l expect……I’ve been told more than once that my Nan doted on me. My very first memory was of being in a large carriage pram outside in the front garden, with a cat net protecting me. Two women were gossiping beside the pram and were saying nothing is too good for this child and that l was the ‘apple of my grandmother’s eye’……What a strange and quite random memory to have? Maybe l held onto this as proof that I was once cherished and part of a family that loved me. Everyone speaks well of my nan, well nearly everyone! So why the bad blood between my dad and my nan?…….. My guess is she didn’t just stand by, but spoke up against my father marrying the evil Audrey, she was a strong woman who’d had a difficult life and she was born under the sign of Taurus, just like my Corrina, intuitive, formidable, but fair. It’s a strange thing, but pretty much all of my close relatives are born under the sign of Taurus, my granddad Bill was born on the 1st May, my dear mother was born on the 8th May, my nan Minnie May was born on the 9th May, & of course last but not least my first child was born on the 13th May, to me, a firm astrology freak, this is mighty significant! Now my dad on the other hand was far from fair born as he was on the Leo/Virgo cusp he had the worst Leo trait, that of thinking he was right when in fact he was very wrong, an arrogance which made him believe he couldn’t/shouldn’t be questioned. I would not, nor would I ever, under any circumstances have made the same devastating decisions…..They were truly irredeemable and disastrous! My verdict is critical…..I belonged with my nan, it’s where l should have stayed. 36 Responses to Gilly Roots…Crumplin…The South…The Surrey Hills. Nice web pages which I found very moving. I am researching the CRUMPLIN family and have details of your grandad William (and your) Crumplin ancestors. You may already have them but if not email me for details. I’m very intrigued and excited by what you have told me, I will email you for details now. Brilliant Tony, as you can see l have filled in so much of the detail thanks to you….Thank you so much. Enjoyed the read…as a Crumplin myself….from Badshot Lea….with close links to the Ewshot/Fleet branch I was interested in the Badshot Lea links….have you Aunt Alice in your tree? Archie from the farm? Many thanks …just picked up & have e-mailed this afternoon! ….My granddad was the eldest and then yours? 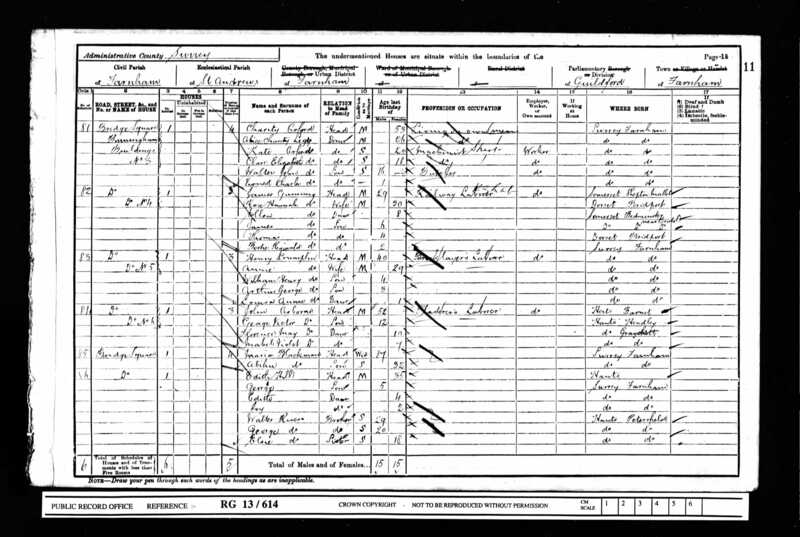 l guess there were other children born after this and probably appear on later census….Hope this is of some help? Are any of Arthur’s Children still alive? My Auntie Lillian is still….She is the middle daughter of my granddad (William)but she is the last of that generation. Hi Gill Yes Arthur is my Granddad, he was married to Ada Ellen Brazier and they had one child, my mum Phyllis who passed away 19 years ago. My sister remembers William (Uncle Bill) But did not know he had a family. Mum never mentioned any cousins. The other siblings William had where. Yes…..Alice had a wonky eye bless her & yes there was an Edie….my Gran Evelyn Pink married and live along the same road back in the day…..she later divorced and married John Fozard(Grandad)….They were all linked to Runfold Farm and Alan Tice……I loved growing up in and around Badshot Lea!! Hi Anthony, I recently got a photo of Alice & Edie from Rosemary, who is the granddaughter of my granddad Bill’s younger brother Arthur (Archie) I’ll put it up on here…..
Hi Gill, My G/dad was William Crumplin’s brother Arthur, I was so pleased to find this site as I didn’t know much about the family. Hi, Cousin, or second cousin! l can’t quite work out exactly what we are ha ha…..Yes that’s help, l’ve just looked back and seen this info so it confirms what l thought, apparently they were living at Badshot Lea, Farnham in 1911. Yes Arthur and Ada lived at 12 St Georges Road, Badshot Lea until 1972. The houses are still there, not been demolished. My mum lived there till 1949 when she got married and moved to London. I think we maybe cousins. My name is Robert Danvers and Lillian is my auntie. My wife found your site while searching the Web. Would love to contact you. Arthur’s brother Charles married an Annie Pink [the name I had on the cencus] And had a daughter Patricia, They did divorce. I remember Patricia had a son. My name is Andrew, and my Mother was Patricia. I remember living with Alice and Edie as a child in Badshot Lea, next to an old guy called Albie, who had a swearing budgie. I went to St Georges Rd and I seem to recognise the terraced house, but I was very young at the time, maybe 3-5yrs. Patrica married someone called Robin Smith ~ 1960, but was divorced after a few years. She then met my Father Vincent John Jones, and moved in with Alice and Edie when he went on the road with his band. We never saw him again, as the sisters decided to intercept all letters from him, and only gave them all to my Mum many years later. She worked at the Anglia Transformers factory, and I was cared for during the day by a Mrs Carter in Tongham. She then married Michael Cragg, and had a Daughter called Julie. I currently live in New Zealand with my Family, and have 4 children. lived 2 doors away. We only came for holidays as we lived quite a long way from Badshot Lea. I am a bit older than you. I remember someone putting a fence up between the houses to stop you running round to the front.. Its funny the things you remember. Mums sister Joy and brother Ray are still around, but Mum is not. Would love to piece some more of the puzzle together as very interested in the heritage! Look forward to hearing more from anyone who can remember more. Hi Andrew…i remember your mum….Robin Smith is my maternal uncle.Yvonne Smith my mum was married to Ray Crumplin your uncle…i remember Alice ! Nan had another daughter Alexia Fozard very late in life having married Grandad John Fozard . Nan Fozard/ Crumplin nee Pink was lovely but very complex and use to live on Shawfields Road Ash….i have a photo of her …she had red hair. Hi Anthony, I remember that name, but not sure if I ever met Robin. I remember Lexie, as my Mum used to call her. The last time I saw Nan Fozard, I think she was having some health issues, possibly Dementia(? ), as she was sat quite still in a chair and did not move much. so exactly how old are you Anthony….by the way my eldest son is called the same name. My Mum Pat did talk about living on a farm when I was younger, but she didn’t seem to have any facility with animals so I wasn’t too sure how much she was exposed to it all…. I’d love to see those pics Julie, it’s surprising how much you can remember when something jogs the memory, all I can say is keep the stories coming family ha ha! Is that Alice Crumplin from Badshot Lea?